Another week another update! Anime Matsuri has ended and we did manage to get the TINIEST bit of info about Crystal out of it. 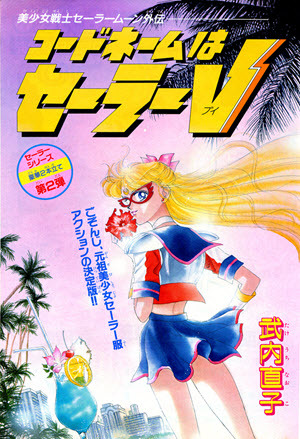 That aside, we have an issue of RunRun which includes Casablanca Memories and another Codename Sailor V chapter! We also made an update to our FAQ to address the most common question we were getting about our removal of the musicals. As always, let’s start with the RunRun issue! With that out of the way, we can share the tiny bit of Sailor Moon Crystal news we managed to get from the Q & A panel with Osano Fumio and Chiaki Kon held at Anime Matsuri. They plan to stick to the manga plot, but writing has only just started. Osabu estimates that it might be 1-2 years before the movie is finished. If you would like to view this information being announced please check out @RalateMoon’s twitter post here. Note: The leak about the movie name was NOT confirmed and appears to be false. Lastly, the following question and answer have been added to our FAQ. As stated by administrators of the website on will we release subtitle-only files? Answer: Unfortunately, no. Despite it being technically possible, the subtitles were made based off of the original online broadcasts from various streaming services in Japan and NOT the DVD releases. While we were hoping to eventually re-time and re-release videos with the DVD source, this is a very time consuming process that we have not made any headway on. When we get a take down notice from official sources, we must comply and cancel the ones that the notice effects. Even if we went and subbed them, we would have no means to guarantee that these would work with no issue, and are unable to offer support for the many ways in which one would create their own subtitled video. That’s all for this week, but stay tuned for sure! We still have plenty of other lovely updates to provide to you next week. Don’t forget that we also have a Patreon! Any amount you pledge to help us support the website is a major help to us! Our monthly hosting and cloudflare bill is $315! On top of that, gathering up Sailor Moon publications and other merch to digitize for the site can quickly get pricey. Enter Patreon – a monthly tipping and rewards site that allows you to support your favorite content creators and get perks as a thank you. Miss Dream’s content will always be free to access, but we are incredibly grateful for any support our visitors can provide to help ease the hosting bill and make it easier for us to keep acquiring materials to share. Even just $1 helps a ton! Looking to have something translated? Let the professional translators at Fandom Services translate your, or your honey’s favorite doujinshi or your best bud’s super rare special episode! Check out Fandom Services on Facebook! They told us it would be two. Wow… I did joke I’d be forty becore Stars was adaptated/Crystal was completed. I rest my case. While I’m glad they’re still working on it – it is so disheartening and incredibly disappointing to see the lack of cohesiveness and power that went into this series. Cardcaptor Sakura’s Clear Arc is what a 20th anniversary/revival should be like. If only Toei put that kind of focus on Crystal. Is it that unpopular?